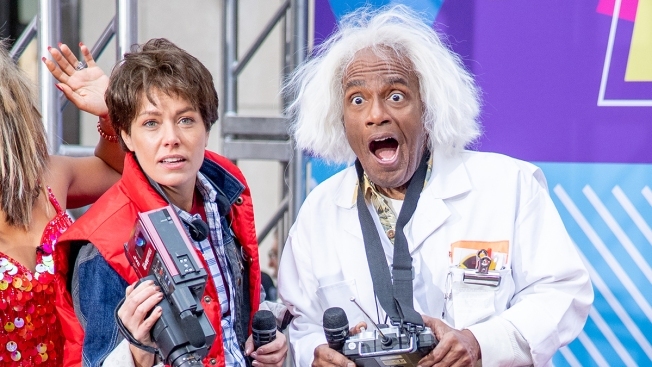 Dylan Dreyer as Marty McFly and Al Roker as Emmett Lathrop "Doc" Brown from Back to The Future during NBC "Today" Halloween 2018 show at Rockefeller Plaza on Oct. 31, 2018. "Today" show meteorologist and co-host Al Roker found himself explaining to some confused viewers exactly what blackface means, following criticism over his Halloween costume choice in the wake of Megyn Kelly's scandal. Last week, NBC canceled her show "Megyn Kelly Today" after she defended the use of blackface as part of Halloween costumes, in a segment on her program. Hours earlier, the "Today" show co-hosts condemned her remarks, with Roker being one of her harshest critics. On Wednesday, Halloween, the group appeared on the air in '80s-inspired costumes. Roker dressed up as "Back to the Future" character Doc Brown, played by white actor Christopher Lloyd in the 1985 film. Some people commented online that Roker's choice of costume--and the 'Today' show's celebration of it--made him a hypocrite and constituted a double standard. "Megyn Kelly loses her show because she posed a question about dressing as an admired character of color if you are of Caucasian background --and yet Al Roker dresses today as a beloved character from an iconic movie who happens to be Caucasian. Is there some hypocrisy in there?" one person wrote on a Facebook post shared on the Today show's page. "I'm going to say this one last time, but the folks who get it, understand and the ones who DON'T, won't," Roker tweeted. "I can be Doc Brown, and I wear the outfit and wig and not change my skin color if you're white, you can be President [Barack] Obama if you want. Just don't color your skin!" Kelly has not commented on her show's cancellation. She had apologized for her blackface comments before her series was axed, in an email to her co-workers and then on the air on her program. "The fact is, while she apologized to the staff, she owes a bigger apology to folks of color round the country," Roker had said on the "Today" show last week. "This is a history going back to the 1830s minstrel shows to demean and denigrate a race. It wasn't right. I'm old enough to know have lived through Amos 'n' Andy, where you had white people in blackface playing two black characters, just magnifying the worst stereotypes about black men--and that's what the problem is. That's what the issue is."